Just so every single stupid person out there knows, New Mexico is part of the United States of America. The image bellow was taken from this site (http://www.juarez-mexico.com/HTML/StreetMap/StreetMap.htm) on November 13, 2005. Pay special attention to the light gray box, below the map on the right. Now, granted, I have no clue why they will not sell to residents of New Mexico, but I have sent an e-mail to the webmaster to ask why. But, if I had to take a stab-in-the-dark, something I am good at by the way, lol, I would guess that they still think that New Mexico, is its own country, when in reality we are not. We are part of the United States of American, and have been that way since January 6, 1912. EDIT (11/14/05 - 01:26) Well, when I said above that I am good at taking a stab-in-the-dark, nowhere did I say I was good at getting things right. So, yes I was wrong. I got a very quick response back the webmaster of the site, and here is his respone on why he does not sell to New Mexico Residents. I stopped selling to New Mexico residents because I live here and don't want to fill out the quarterly tax forms. 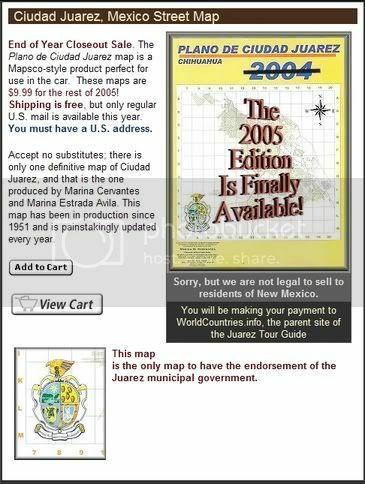 In 2002 and 2003 combined I sold two maps to people in New Mexico, and it just wasn't worth the trouble. Sorry for the inconvenience. So yes, I am wrong and I will admit this.